Early Periodontitis - Continued inflammation of the gums can result in the gums pulling away from the teeth, allowing for formation of "pockets" filled with bacterial plaque, calculus (tartar), food debris and pus. This painless infection now has resulted in damage to the bone (socket) supporting the teeth. Moderate Periodontitis - Further spread of the gum infection results in further loss of bone support. Lose, shifting teeth and more obvious recession of the gum can be seen. 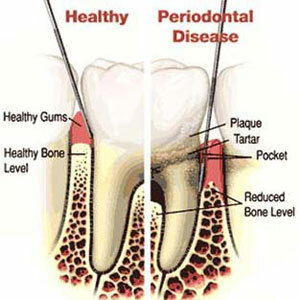 Advanced Periodontitis - Advanced gum disease is one of the leading causes of tooth loss in adults. Painful gum abscesses can occur as the deeper infection gets trapped under the gum, resulting in a buildup of painful pressure and loose teeth. Periodontitis is a very common form of gum disease usually represented by infected gums. When bacterial plaque in our mouths accumulates in hard to clean areas it causes inflammation and damage to the gum tissue. Eventually the gums pull away from the tooth which allows more bacterial plaque, tartar, pus and food debris to fall into the gap, or pocket, between the tooth and gum. If allowed to continue the bone support anchoring the teeth will begin to dissolve away leading to tooth loss. Using antibiotics alone is limited help as the deposits of plaque, tartar, food debris and pus still remain after the antibiotics have been completed. An effective way to control infection and allow for natural healing is conservative (non-surgical) periodontal therapy. This consists of education in personal Oral Hygiene followed by a series of procedures called scaling and root planing.Scaling & Root Planing involve a series of regular and deeper cleanings to remove all contamination above and below the gum line including the root of the teeth. Scaling and root planing are usually done in one section of the mouth at a time using local anesthesia for the patient’s comfort. Once a few scaling and root planing procedures have been completed the healing of the gums can be re-evaluated to determine if any permanent damage and to what extent has been done. A Periodontist is a dental specialist who treats the supporting structures of the teeth including the gums, roots and bone. Diagnosis is very important, and emphasis is placed on prevention. The goal of Dr. Vigliotti is to recognize disease, determine if it is advancing and then stop its progression. Dr. Vigliotti´s job is to assure that the foundation is adequate for dental restorations such as crown, bridges or dentures. This is very important if you are about to invest in your teeth! In addition, a periodontist and general dentist can work together to restore missing teeth with the placement and restoration of implants. Dr. Vigliotti will help you understand if other health factors are involved in your periodontal disease, such as cardiovascular disease, respiratory disease or diabetes. Current research has shown important relationships and we will be glad to discuss this with you. A patient's comfort is very important to us, and we can usually provide excellent control of discomfort with local anesthetic, a variety of anti-anxiety methods and a very gentle touch.